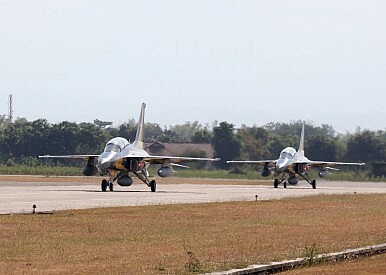 The T-50i, Indonesian air force version, after landing at an air base in 2013. New agreements formalize investment and division of labor in plane’s development. On January 7, South Korean aircraft manufacturer Korea Aerospace Industries (KAI) inked two key pacts with Indonesia to facilitate their joint development of a new fighter jet. As I had reported previously for The Diplomat, Indonesia and South Korea have been looking to collaborate on the development of the new Korean Fighter Experimental (KFX) 4.5-generation aircraft since both countries first signed a letter of intent back in 2009. The first phase of the project – the technical phase – ended in 2014, and KAI was selected as the preferred developer of the KFX in March 2015. In recent months, both sides have been trying to work out details that will govern the second phase of the KFX program: the engineering and manufacturing development phase (See: “South Korea, Indonesia Firms Ink New Defense Pact”). Movement has also been seen on several fronts. Last month, KAI signed a contract with the Defense Acquisition Program Administration (DAPA), South Korea’s defense procurement agency. In addition, an important offset agreement was reached between the United States and South Korea to allow the transfer of key technologies for the project. The first was a cost-sharing agreement between KAI the Indonesian Ministry of Defense (MoD). That agreement effectively formalizes an earlier understanding about how the cost is split within the KFX development program. Indonesia will invest about 1.6 trillion won ($1.3 billion) in the 8.6 trillion won contract, footing about a fifth of the development costs. Indonesia’s investment is expected to begin in April and increase over time. In exchange, Jakarta would be given one prototype plane and access to some technical data involving the project. The second was a work assignment agreement between KAI and Indonesia’s state-owned aerospace manufacturer PT Dirgantara (PTDI). As part of that pact, KAI said PTDI will send 100 engineers to South Korea in May to take part in the structural design of the new aircraft and play a role in its development over time. With these details finalized, Seoul and Jakarta have taken another important stride in realizing this project. South Korea is looking to get the planes in service by 2026. Seoul is looking at 120 new aircraft to replace its aging F-4 and F-5 fighter aircraft, while Jakarta will purchase about 50 planes. KAI has estimated an export market of 600-700 aircraft in addition to the requirements of both air forces. Agreement expected to facilitate cooperation on new fighter jet. What Does the New Submarine Deal Mean for South Korea-Indonesia Relations?What’s in the Indonesia Navy’s New Tank Landing Ship?What’s Next for Indonesia’s Aerospace Ambitions in 2018?Indonesia Warships in Philippines on Goodwill MissionIndonesia: A New Shipbuilding 'Magnet' from ASEAN to Africa?